By 1931, Al Capone was the kingpin of the criminal enterprise system that ruled Chicago from top-level politicians down to neighborhood shopkeepers. There were other gangs, but his South Side “Chicago Outfit” stood supreme. This was not to say, though, that he was secure. He was in constant danger from rivals—to the point that he was often absent for significant periods of time from his 7244 South Prairie Avenue home,1 barricaded either in one of the successive hotel strongholds he established in Chicago or a secluded fortress in northernmost Sawyer County, Wisconsin. The apple of Capone’s eye was his son Albert Francis Capone, born two months prematurely on December 4, 1918, just prior to Al’s marriage to Mary Josephine (born Coughlin, known as “Mae”) Capone, the child’s mother.2 The boy was called “Sonny” from birth and grew up in a sheltered, especially protective, environment dictated by frail health and concerns for his safety. By early adolescence, however, Sonny had bested a series of serious ear infections and bouts with the usual childhood illnesses and looked forward to the limited time his father spent with him. 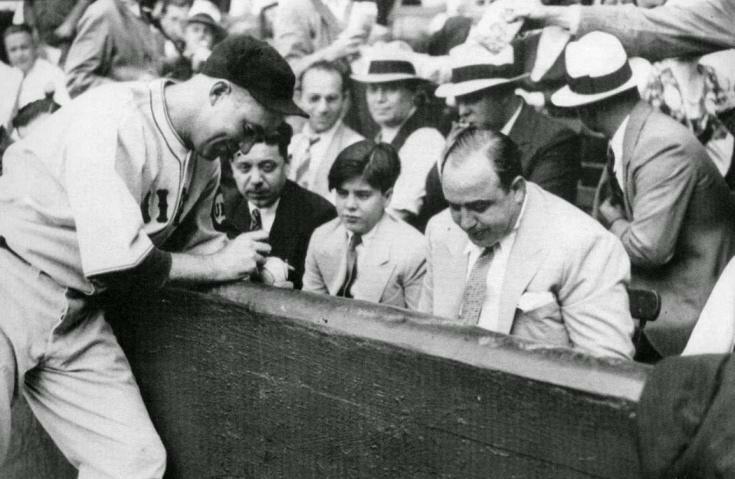 Away from home much of the time yet apparently determined to bond with his only child in a time-honored American tradition, Al Capone treated 12-year-old Sonny to a ballgame in the late summer of 1931. The occasion was an inter-league, cross-city exhibition game between the Cubs and White Sox at Comiskey Park on September 9. The game was to benefit an unemployment relief fund established by Illinois governor Louis L. Emmerson as the Depression strengthened its grip on the country. The Sox’ commitment to the cause was evident. They had started a road trip in Cleveland two days earlier and played back-to-back doubleheaders there; two days later, the road trip, scheduled through the rest of the season, would take them to New York and beyond. The Cubs had just returned from a road trip and would remain at home the rest of the season. Capone and Sonny saw “a game worthy of its cause.”8 It featured a pitching matchup between the Cubs’ Charlie Root and the Sox’ Urban Clarence “Red” Faber, both right-handers. In his seventh season with the Cubs, Root was 32; Faber was 43. Faber, who would retire after the 1933 season and reach the Hall of Fame in 1964 through the Veteran’s Committee, had been pitching for the Sox for 18 years. He was 9-12 on the season and had won his last start, a complete-game, eight-hitter against Cleveland. Root was 15-13 for a better team,9 but had lost his last start, against Pittsburgh. The Cubs broke through against Faber in the sixth. Rogers Hornsby, in his first Cubs season as player-manager, hit a fly ball that Watwood dropped in center field; Hornsby then advanced to second base on a passed ball by Sox catcher Frank Grube. After Vince Barton fouled out to Grube, Danny Taylor grounded to Sullivan at third and the Sox nailed Hornsby in a rundown. Then Charlie Grimm singled and Faber walked Gabby Hartnett. It loaded the bases, but brought up Root, who had struck out in his first at-bat. Root foiled the strategy with a single through the right side of the infield. That scored Taylor, but Grimm, fearing Smead Jolley’s arm in right field, stayed at third. Woody English flied out to end the inning. The Sox mounted a comeback of sorts in their sixth. Sullivan singled to right. After Jolley flied out, Lew Fonseca singled. With runners on first and second and only one out, the Pale Hose appeared to have something going, but Sullivan ventured too far off second base and Hartnett nailed him with a pickoff. Then the Cubs got the third out on some unintended around-the-horn razzle-dazzle. Hornsby, who played only 192 of his 2,164 career games at third base, had installed himself there for this game. When Watwood bounced to him, his throw attempting to force Fonseca arriving at second was well to the right of the bag. The Cubs’ coverage there was so out of synch that second baseman Billy Herman was still near his original fielding position. He caught Hornsby’s wild throw and relayed to first base to nip Watwood. The visitors added two more runs in their eighth when Root, again finding his oft-misplaced hitting clothes,11 doubled over third base off rookie Vic Frazier to score Barton and Taylor. Jolley reached on a single in the Sox’ ninth, but a double play closed things out at 3-0, Cubs. Root had gone the route on a six-hitter. Less than a month later, on October 6, 1931, Al Capone went to trial in federal court on income tax evasion charges after a plea bargain agreed to by prosecution and defense involving a minimal jail sentence was disallowed by the presiding judge.13 Capone was convicted on October 17 and sentenced to an 11-year prison term on October 24.14 Physically ailing, Capone was released early for good behavior on November 16, 1939,15 and spent his last years in increasingly failing health due to complications from neurosyphilis.16 He was 48 when he died on January 25, 1947, at Palm Island, Dade County, Florida. The ballpark photo (Note 3) in Deidre Bair’s fascinating new Capone biography (full citation in Note 1) inspired this account. According to Bair, prior to his imprisonment Al Capone was not averse to favorable press coverage, especially staged photos. The September 10, 1931, Chicago Tribune, which I accessed through Newspapers.com, provided a box score and broad coverage of the game. The Tribune also carried the photo as part of an all-photos page separate from its sports coverage, where the paper published an eighth-inning action shot, a posed pregame photo of Red Faber and Charlie Root, and a front-row box seat picture, presumably taken “on the Cubs’ side,” of Sox manager Donie Bush with Cubs president William Veeck and owner William Wrigley Jr. As Note 3 indicates, the Tribune did, however, include a passing reference to Capone’s presence in Edward Burns’s sidebar story. In addition to the sources cited in the Notes, I used team and player pages and game and season logs from Baseball-Reference.com and Retrosheet.org. 1 The South Prairie property was a two-family home, occupied by Alphonse Gabriel (“Al”) Capone’s birth family and his marital family. His mother Teresa and sister Mafalda lived on the ground floor; his wife Mary Josephine (“Mae”) and son Albert Francis (“Sonny”) lived upstairs. As Mae had Irish heritage that offended Teresa’s Italian perspective on the world, the women were often at odds and rarely mixed except in deference to Al. Deidre Bair, Capone: His Life, Legacy, and Legend (New York: Nan A. Talese/Doubleday, 2016), 42, 69. 3 This description is derived from photo opposite Bair, 244, which includes in its cutline: “Cubs player Gabby Hartnett made a point of autographing a baseball for Sonny while Cubs fans cheered support for Al Capone.” When Commissioner Kenesaw Landis saw the published photo, he is said to have telegraphed Hartnett, advising him that he was no longer permitted to have his picture taken with Al Capone. Hartnett reportedly replied, “OK, but if you don’t want me to have my picture taken with Al Capone, you tell him.” Stephan Benzkofer, “Public Enemy No. 1 Was a Baseball Fan Too,” July 2, 2011, ChicagoTribune.com, accessed December 10, 2016. “Sox side” reference: Edward Burns, “34,865 Fans Pay $44,489 at Sox Park,” Chicago Tribune, September 10, 1931: 21, 23. 4 Mario Gomes, “Capone At The Ballpark,” MyAlCaponeMuseum.com, accessed December 10, 2016. 5 Vincenzo Antonio Gabaldi, also known as “Machine Gun” Jack McGurn, one of Capone’s most trusted operatives, was seated directly behind him. Ibid. 6 Baseball-Reference.com attendance figures for the White Sox’ 1931 games aren’t complete, but the only listed Comiskey Park crowd of record that season larger than the 34,865 for the September 9 charity exhibition was 50,911 for an August 23 doubleheader with the Yankees. 8 Irving Vaughan, “Root Drives In Every Run of Charity Game,” Chicago Tribune, September 10, 1931: 21-23. 9 The Cubs were 71-68 and in fourth place in the National League. The White Sox were 52-84 and, as noted, in seventh place in the American League. 11 Root hit .180 in 1,190 plate appearances over 17 seasons. He drove in an average of just under five-and-a-half runs per year. 12 Harvey T. Woodruff, “In the Wake of the News – Sweet Charity,” Chicago Tribune, September 10, 1931: 21. 13 Bair, 229, 231. The judge was James Herbert Wilkerson. He had replaced Kenesaw M. Landis on the Chicago federal bench when Landis resigned effective March 1, 1922. “Landis Quits To Aid Legion and Baseball,” Chicago Tribune, February 19, 1922: 1. Landis had become baseball’s first commissioner on November 12, 1920, but continued to serve both as a federal judge and baseball commissioner until he resigned the judicial position 15 months later. “Landis The Big Umpire,” Chicago Tribune, November 13, 1920: 1. 17 Sonny and Diana’s wedding was on the 23rd anniversary of Al and Mae Capone’s wedding. Ibid., 286. 18 “Sonny Capone in Miami,” JanesHistoryNook.blogspot.com; “Albert Francis ‘Sonny’ Capone,” FindAGrave.com, both websites accessed December 7, 2016; “Mrs. Capone” reference: Bair, 316. 19 Bair, 318. Numerous internet sources, including FindAGrave.com, state Sonny Capone’s place of death as Florida. Bair, who did comprehensive contemporary research on the family for her book, places his death in Cool, El Dorado County, California. Sonny Capone’s date of death in his FindAGrave entry, stated as August 4, 2004, also differs from Bair’s (July 8, 2004). 20 Three of the four were still living as of 2016. Ibid., 316.